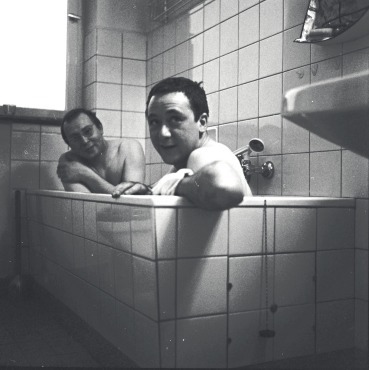 Taking a bath together: Sigmar Polke (in the back) and Gerhard Richter (in front), 1966. Rub-a-dub-dub, two art titans in a tub. The seldom seen photos, like ‘Taking a bath together’ (1966), and archive material accompanying this survey don’t quite paint a picture of two of Germany’s most respected artists as the Morcambe and Wise of art but they do reveal how closely the pair worked together at the start of their careers. And the careers of Sigmar Polke (1941-2010) and Gerhard Richter (born 1932) set the course of contemporary European painting over the past half century. As founders of ‘capitalist realism’ in 1963, they hatched a movement that would quickly become a European corrective to US pop art, mining their country’s troubled history to parody both capitalism and communism, while tackling the thorny issue of authorship that would obsess every painter in their wake. Their work first gained a wide audience in London at the Royal Academy’s legendary 1981 exhibition ‘A New Spirit in Painting’, a show mentioned in hushed, reverent tones by anyone lucky enough to have seen it. To see Polke and Richter larking about in black and white shots humanises these demi-gods in a way that no other London show of their work has done before. You believe Richter entirely when he says that he was closer to Polke in the 1960s than he had ever been to anyone. The show, in part a recreation of their renowned 1966 two-man exhibition in at Galerie h in Hanover, tightly enmeshes their art with an initial flurry of stylistically distinct but equally sardonic takes on pop. Their distinct personalities (Richter a purveyor of cool realist blurs and squeegeed abstract splurges; Polke a slippery magician wilfully unfaithful to any single subject or style) quickly take over, though, leading you along divergent but equally thrilling paths. Polke’s freestanding two-sided paintings from the mid-1980s capture him at his capricious best, while for Richter in über elegant mode, look no further than ‘Kerze’ (1982), one of his classic candle paintings. Its masterpiece quota may be low, but the show immerses you in one of the most fruitful art dialogues of the twentieth century. It also acts as an appetite whetter for Tate Modern’s forthcoming Polke retrospective, which is currently being showered with five star reviews at MOMA in New York. The exhibition at the Fondation Beyeler is the largest ever in Switzerland to be devoted to Gerhard Richter (born in Dresden in 1932, now based in Cologne), arguably the most important artist of our time. It centers for the first time on the artist’s series, cycles, and interior spaces. A counterpoint to these is formed by a number of single works, many of which have achieved iconic status. Some hundred pictures are on show — portraits, still-lifes, landscapes, abstract images — along with two glass objects and sixty-four overpainted photographs. The selection encompasses the major periods in Richter’s career since 1966, including recent works not yet seen in public. In a career spanning sixty years Richter has created an oeuvre of striking thematic and stylistic variety. He has used photographs as the basis of figurative paintings. His abstract works range from pictures featuring color to monochrome fields and digitally generated compositions. “If the abstract pictures show my reality, then the landscapes and still-lifes show my yearning,” he wrote in 1981. The artist has also addressed recent history. The exhibition therefore includes the legendary fifteen-part cycle from the Museum of Modern Art, New York, revolving around the Baader-Meinhof gang and the events of October 18, 1977. In the 1950s Richter studied mural painting at the Art Academy in Dresden. Since then many sketches and statements by him have testified to the crucial role played by architectural contexts in his work: “That is such a dream of mine — that the pictures will become an environment or become architecture.” Richter’s interest in the interaction between single pictures, groups of works, and the surrounding spaces is explored vividly in the exhibition, which has been put together by curator Hans Ulrich Obrist in close cooperation with the artist. Sigmar Polke Girlfriends (Freundinnen) 1965/1966 © 2013 Estate of Sigmar Polke / ARS, New York / VG Bild-Kunst, Bonn. This groundbreaking retrospective of the maverick Sigmar Polke (1941–2010) will explore the full scope of his work. A key figure in the first generation of post-WWII German artists alongside Gerhard Richter and Blinky Palermo, Polke took a wildly different approach to art-making, from his responses to consumer society in the 1960s to his interest in travel and communal living in the 1970s and his increasingly experimental practice after 1980. This will be the first exhibition to bring together the full range of media in which he worked – not only painting, drawing, photography, film and sculpture, but also notebooks, slide projections and photocopies.